It was based on a poem written by Dr. Brewster Higley according to this wikipedia entry with no cited sources, and is a bit amusing as there are apparently no real antelope in Kansas or anywhere in North America. But I digress, this is more about what you might best describe as the bottom of “the bush food chain”. 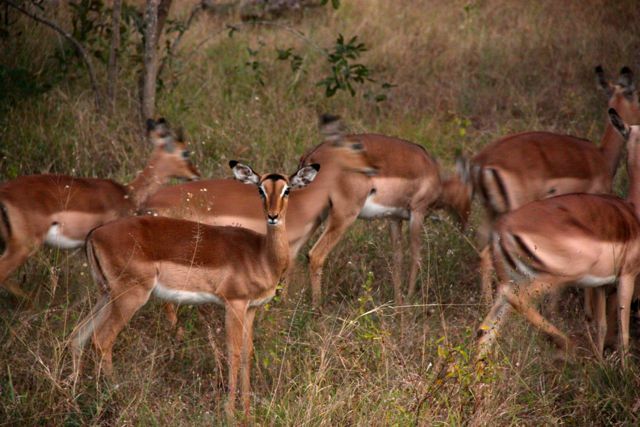 These perky, prolific, wonderful, innocent and kind looking impalas (there are several types of antelope) are like the KFC of the bush, if you will. 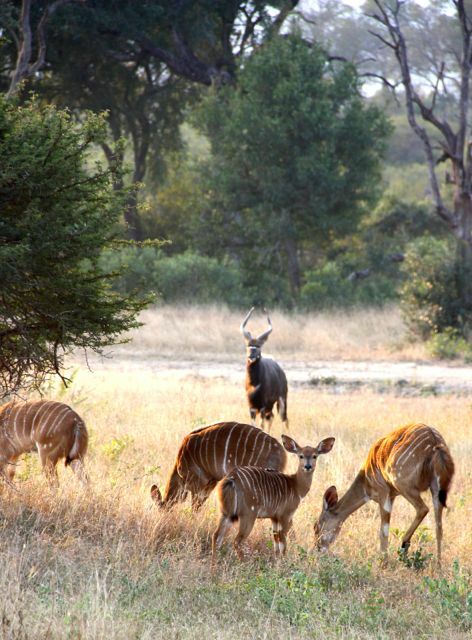 Up top, several impala ewes with ears on alert while they graze in a field. I thought to myself, nervous nellies with attention deficit disorder. Unkind, I know. 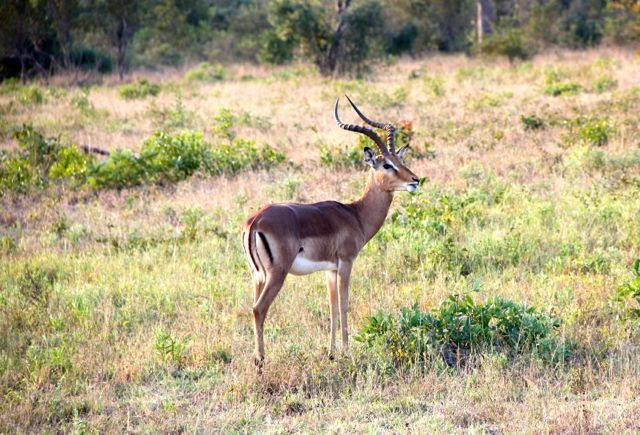 They were actually very beautiful animals in all variations… up top impala ewes… we also saw a few rams messing around with mock fights on the nearby fields. 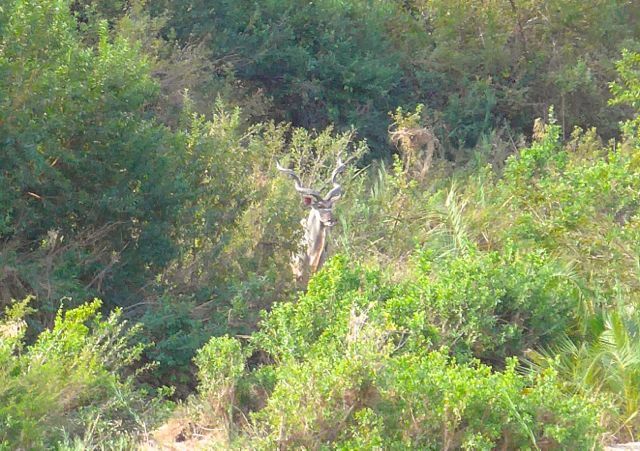 One of these large nyalas (also a type of antelope) was standing just a couple feet away from us on the stone path to our villa one evening and when my flashlight panned across its large body Mrs. MM was so startled she grabbed me and nearly let out a scream, to the amusement of our porter. She probably wanted to make sure I was munched on first. 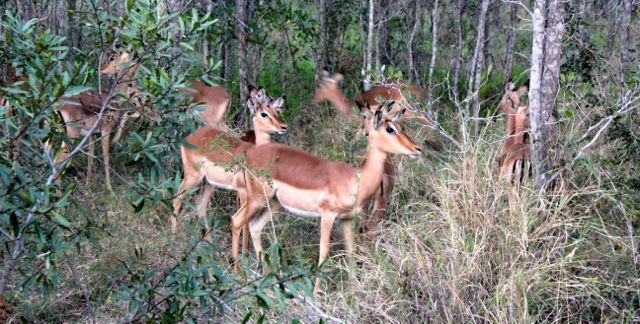 Some younger female nyalas in the foreground and a male in the background. 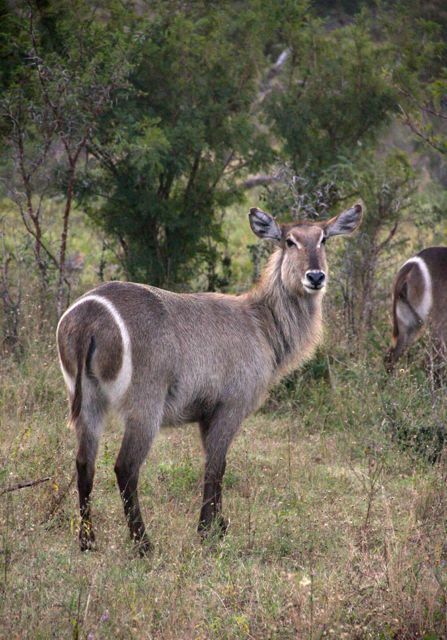 …and waterbucks with their characteristic “toilet seat” marking of white fur around their rear ends. Now that you’ve seen the prey, let’s talk briefly about the predators. 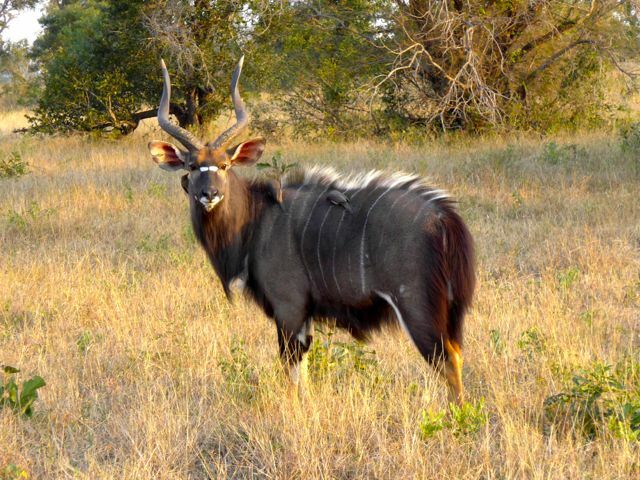 “The Big Five” – Wherever you go in South Africa (and elsewhere in safari country), the talk is of seeing elephants, rhinoceros, lions, leopards and cape buffalo. To see all of them in one short trip is nothing short of a miracle. When asked, we listed buffalo as being the last on our wish list, since we have carabaos and tamaraws back home, so the search for those was our lowest priority. 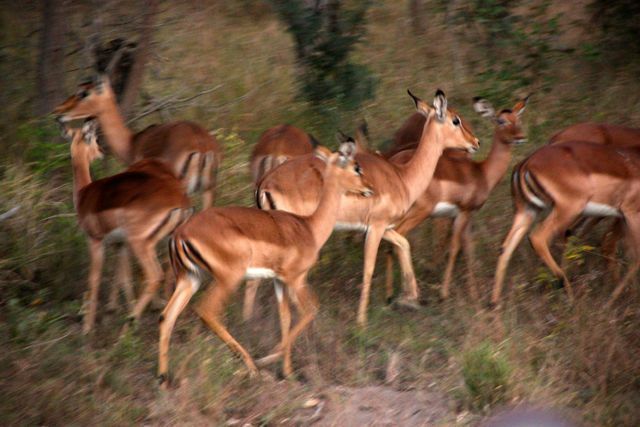 “The Magnificent Seven” – Add to the Big Five, cheetahs, and surprisingly for me, packs of wild dogs. The latter one of the rarest of animals to spot these days, and sometimes they go 6-8 months at Singita without seeing them. Cheetahs are also tough to find, and they aren’t that plentiful either. So I am sure you are thinking, what about the “Disney” and “Tarzan” type animals like giraffes, zebras, hippos, baboons, warthogs, etc.? Well, Mrs. MM definitely wanted to see giraffes and hippos more than cape buffalo so we were hopeful we would find some of those in the bush. Notice, all of the wonderful antelope up top would make many a jaded city dweller perk up in their seats and click away with their cameras, but this was just the “chicken of the bush”!!! All photos in the South African posts are taken by Mrs. MM, MM and the young lady. We have over 4000 shots combined, so we won’t give credit for each individual shot. The photos were taken over several drives over a three day period. What a SPECTACULAR trip! Thanks for sharing it with us via your blog. Lucky if you see all the animals in your alphabet or number list. Lovely sentiment there Connie C. I would have thought it was telling my life’s story except of course, the piggy backing within everybody’s sight part. Ha, ha, ha, as always Footloose. You would have been a very interesting neighbor for me and my husband ( who is a silly Lolo himself)…as I learn many things from you checking/googling words such as the meaning of lagniappe as I have forgotten if it is an ornament or gift or going back to literature readings as you cite them. And thanks for MM’s website that allows this early morning tertulia	( sort of). Ha!ha!ha! You are funny Footloose! And ConnieC that is a lovely description of life in the bush! MM, although I like zoology in college,I don’t think I’m brave enough to have close encounters with wildlife sans the bars! I assumed you brought telephoto lens to get pictures like these! MM, you seem to have repeated a couple of sentences above. ….like I said, I was so inspired….and while doing an online fantasy, I realise I could also do the marine big 5 from cape town – whales, sharks, dolphins, seals & penguins. And then there’s the food and wine at reasonable prices…..
Oh man. Looking forward to the rest of the series MM. Hi MM – Great photos! I’m sure you’ve looked into it but thought I’d protectively suggest for you to use watermarks on your photos (perhaps not all, but selected), to protect you from (illegal) download and use of photos without proper credits. Our company is involved in several legal cases protecting the works of our international photographers, and there are other firms that can track the download of their photos and subsequent use. 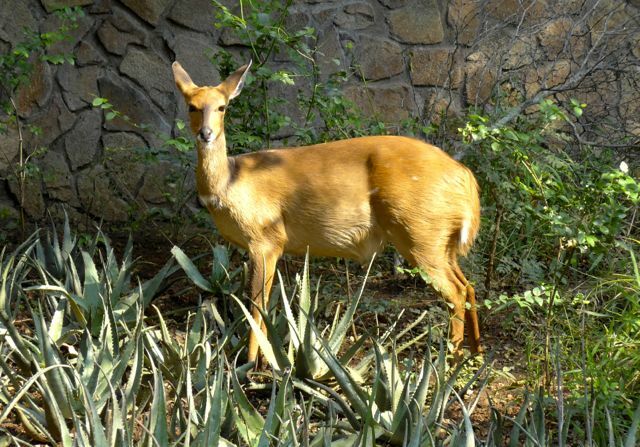 The song refers to pronghorn antelope, which are not antelope at all but their own sui generis taxon. Curiously, their closest living relatives are giraffes. Fantastic trip Marketman, I’m sure those animals were viewed for a safe distance. No springbok? What camera & lens combo did you use? In Season Now – Superb Cantaloupes!